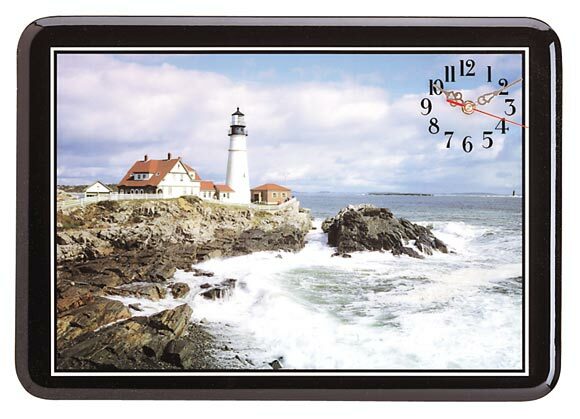 Welcome to our page of clocks, wall clocks and watches. Please enjoy your visit and thank you for looking. 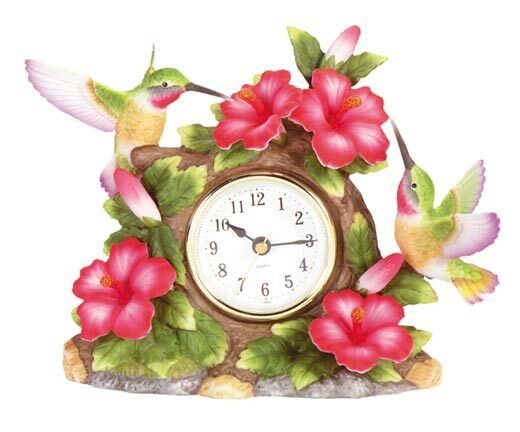 It's time for lunch and these cheery hummingbirds aren't going to miss a minute of sweet nectar time. Quartz movement, uses one 1.5v battery (not included). 7 1/2" x 3 1/4" x 6 1/4" high. Item #29488 - Price $29.99. 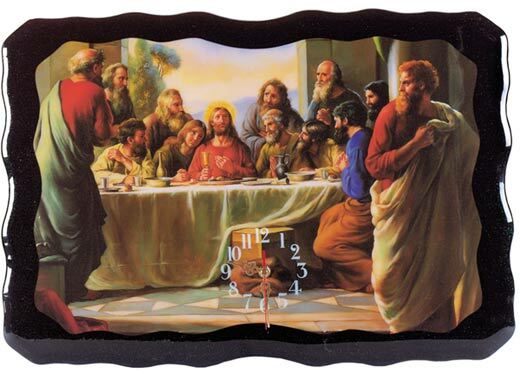 The last supper is dramatized in all its brilliance on this quartz movement wall clock. Wood, uses one AA battery (not included). 22 1/2" x 1 1/2" x 15 3/4" high. 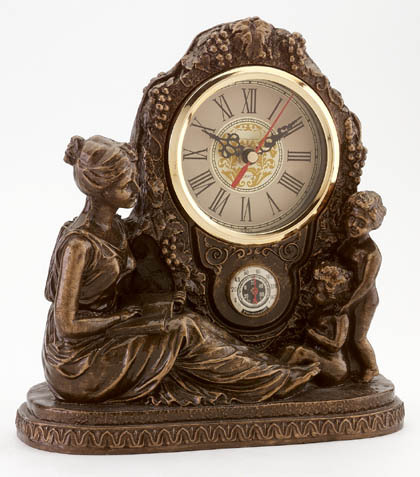 Italian antique, mantel clock. Ornate floral design, 13" x 6 1/2" x 16 1/4" high. Alabastrite. 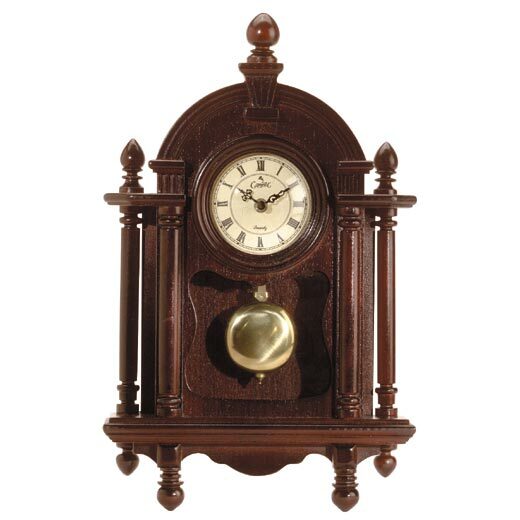 Crafted on wood and bearing a shiny pendelum, this classically design wall clock runs on one AA battery, not included and will give you many hours of pleasure. 10 1/4" x 3" x 16" high. Standing stalwart on the rugged coast, the lighthouse is a beacon of safety for all seafarers, this excellent example graces a plaque complete with a battery operated quartz movement clock. Uses one AA battery, not included. Wood, 21" x 15" high. 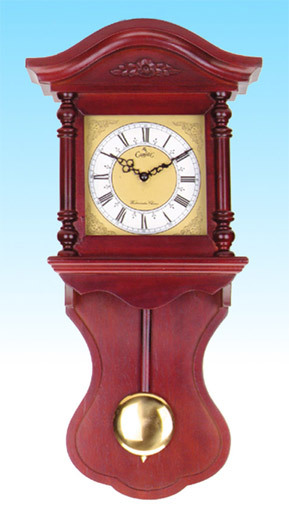 Hanging wall clock is reminiscent of bygone days, with a genuine brass pendelum and space age quartz movement. Genuine wood in mahogany color finish. 10" x 4 1/2" x 21 1/2" high. 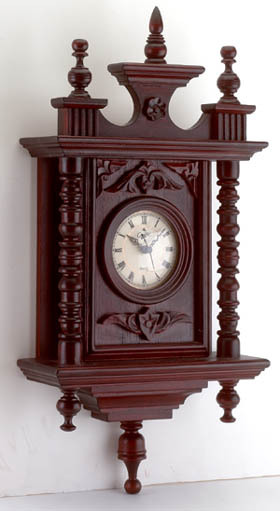 Intricately hand carved wooden wall clock with quartz movement. 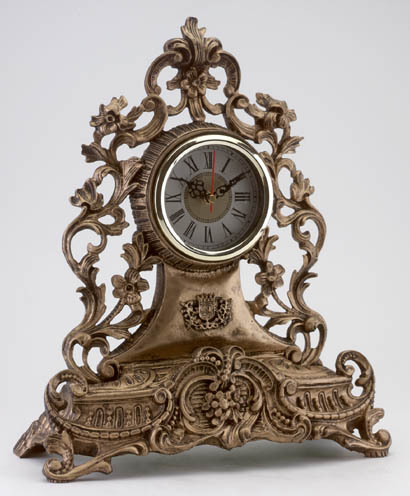 Antique design with roman numerals. Mahogany color finish. 9 1/2" x 4 1/2" x 17" high. Italian antique mantel clock with thermometer beneath dial. 9 1/4" x 4 3/8" x 9 1/2" high. Alabastrite. 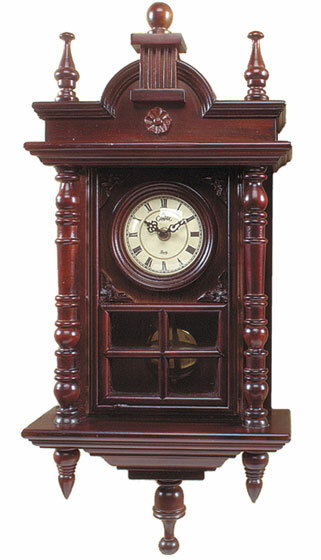 Authentic rendition of century old clock, handpainted of genuine teakwood in mahogany color finish. 9 1/2" 4" x 17 3/4" high. 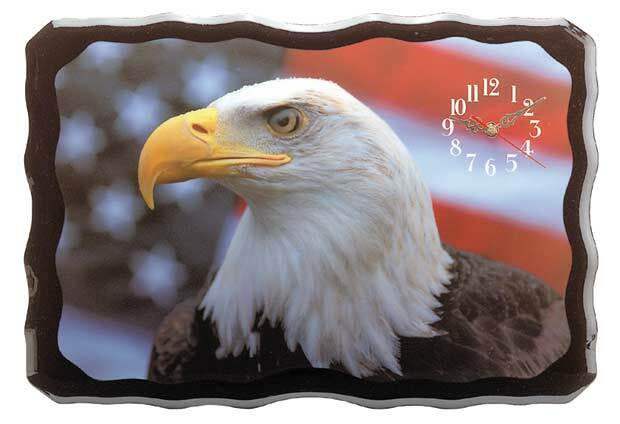 Two symbols of liberty, the american eagle and the stars and stripes, come together on this quartz wall clock to remind of the freedom we possess. Wood, uses one AA battery, not included. 21" x 15" high. 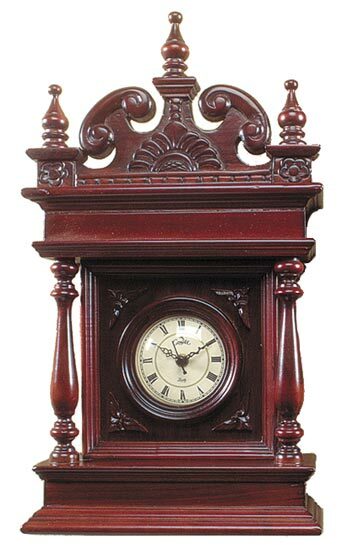 An attractive floral carving on the face of this wooden wall clock adds a distinctive touch of elegance, mahogany color finish, brass pendant, hourly chime. 11 1/2" x 5 1/8" x 22 1/2" high. 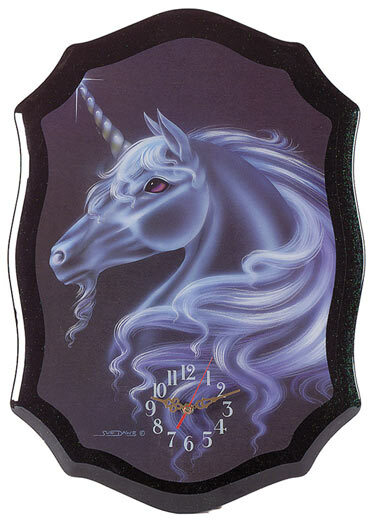 The mythological unicorn is presented on this quartz movement wall clock. Wood, uses one AA battery, not included. 15 1/4" x 1 1/2" x 21 3/4" high.